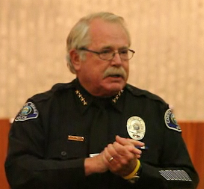 In a press release today (text of which is included below) Costa Mesa Interim Communications Director Bill Lobdell announced the plans for the reorganization of the Costa Mesa Police Department that City Chief Executive Officer Tom Hatch will present to the City Council at the Study Session next Tuesday, June 14th in council chambers beginning at 4:30 p.m. Although links to the plan were attached to the press release, the Study Session Staff Report was also released today and it's much easier to navigate through. You will find that report HERE. There are links to the various elements mentioned in the press release, as well. organizational restructuring plan for the Costa Mesa Police Department to City Council members for their review. The plan would save the City $1.35 million annually while maintaining comparable levels of service hours. The proposal—which includes 23 recommendations—would add 10 additional sworn reserve officers (7,382 hours annually), two K-9 units to patrol, four helicopter pilots to ground-based duties, two park rangers, a crime scene specialist and four support jobs. In exchange, positions for 12 sworn officers and one non-sworn commander would be eliminated, likely through attrition. The reorganization would also create a regional Special Weapons And Tactics (SWAT) teamand fold the telecommunications department (9-1-1 center) into the police department (92% of the 9-1-1 call volume is for police services). A police lieutenant would replace a civilian manager of the telecommunications department. The net reduction to the police department would be the equivalent of four full-time positions. Other suggestions include outsourcing of animal control services, expanding the police department’s volunteer program, implementing a succession plan for department personnel and reviewing the department’s traffic bureau. Under the plan, the number of sworn police officers would be 131, with five of those positions funded by a federal grant the City has already received for $1.8 million over three years. The analysis and initial recommendations for the police restructuring was part of a three-and-a-half-month-long study by Management Partners, a consulting company that used Mike Messina, the former police chief in Brea, for the report. 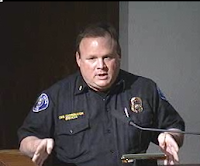 Interim Police Chief Steve Staveley also provided analysis and recommendations for consideration. The reports are attached, along with details on the fiscal impact. Hatch will give a presentation of the proposed organizational restructuring at the City Council Study Session at 4:30 p.m. Tuesday in the Council Chambers. WILL THEY FOLLOW GOOD ADVICE OR...? The Study Session is going to be very interesting because we're going to find o ut once and for all whether this city council will take the advice of the professionals in the field - their hand-picked CEO, Interim Police Chief Steve Staveley and the consulting firm to whom they paid tens of thousands of dollars for their assessment and recommendations for the most cost effective and efficient Police Department - or if they will ignore all or major portions of the recommendations and follow their preconceived opinions about staffing levels. Also on t he agenda is one more pass at the 2011-2012 budget. The staff report, HERE, shows in detail how Hatch has managed to present a balanced budget for the council to consider. The changes that accomplish that objective include those he is recommending for the restructuring of the Police Department. Any modifications the council makes to that plan will certainly alter Hatch's balanced budget. Among the positions proposed to be deleted in this pass are an Animal Control Officer. This particular position was salvaged last year after a tremendous outcry by members of the public. I doubt a similar outcry this year will be effective - these guys just don't care. Also to be eliminated is the civilian Emergency Medical Services Coordinator position. This is the job held by the outspoken Larry Grihalva, who you may recall stepped to the speaker's podium several months ago to educate the council. I'm assuming the deletion of his job is merely a coincidence - or is it? You'll recall that I've told you over and over again that this council DOES NOT LIKE an opposing opinion. This may be the consequence of being outspoken - or not. Another job sacrificed to the Police Reorg/Balanced Budget is that of the Telecommunication Manager. That organization will be assigned to the Police Department and a new Lieutenant position will be filled to manage that function. Again, it will be interesting to see if this city council will set aside dogma and do what is right for the city when it comes to the budget. Quite honestly, I don't think they will be satisfied with a balanced budget. I think they're going to want to throw a mountain of cash into the Reserves and will sacrifice bodies to do it. I really do expect them to direct Hatch to return on June 21st with a new, revised budget proposal that will give them at least $1 million to put in the cookie jar. That will mean, in all likelihood, another eight staffers will be lost. Since Mayor Pro Tem Jim Righeimer is intent on having a 125 sworn member police department, that's where six of those bodies will come from. I'm left, once again, with concern for the future of our city and for the safety of i ts residents. With the slashing of the Police Department staff and the dissolution of the ABLE program the residents and visitors to our city will never be safer than they are as you read this. This city council, with its blind allegiance to the GOP party line, seems more than willing to place every one of us at risk to advance their political agendas and futures. We are operating today in an environment where the city council apparently distrusts its appointed CEO, its Interim Police Chief and the city staff in general. We're in a time where at least a few members of the city council are angry at the staff and seem more than willing to make the public pay for the grudge they hold. I've written in the recent past that they have created a hostile work environment, but it's gone way, way past that definition now. No, the actions they're taking are turning an efficient, competent, motivated workforce into a group of people looking over their collective shoulders all the time. Gone are the days when a simple request could get them all leaning into the harness at the same time, pulling hard for the good of the city. Now they expect to feel the whip across their haunches and are spooked at the slightest sound. I suspect they'd be happy for something as simple as hostility about now. At the last Council meeting and study session, Jim Righeimer repeatedly called for an increase in the number of Police Reserve Officers, and the newly-released study adds 10 of them. Did he have advance information on the study's recommendations, or did he have influence over them? Maybe it's just pure coincidence, but these days I have seem to believe less and less in coincidences. Maybe somebody should tell the City Council that the senior management of the fire department has already been gutted, and there are legal requirements for paramedics and firefighters to maintain certification on their training. I wonder how many of the CMPD are registered republican voters, and how many other city staffers as well as police and firemen from other cities and counties are registered as republican ? Maybe it's time to change to "decline to state" or maybe even become a democrat because the republican party seems hell bent on the destruction of the government employee. Pentagon and Valan2 are correct. However, remember that they (this Council) doesn't seem to have a City Attorney who gives the Council THE legal advice and lets them make whatever choices they want. Now it appears only the Yes or No that his masters want. Council had to literally "fire" several rounds from their power gun before finding someone they wanted. Don't you wish "in- house" counsel were there like the better old days in our City? Isn't the private sector and outsourcing wonderful! Wow....does it make sense to eliminate a civilian position that of the telecommunications manager to a sworn position of a LT. Who is 3 percent at 50 and 6 figure income? That's saving the budget! Where as the Telecommunications manager is less pay and 2.5 at 55...maybe they should hire a math tutor for Hatch!! I'm guessing a 6th grade tutor would do at minimum wage or maybe hire a consultant at 3,000 a week to tutor! Which seems to be the norm with the board of clowns! I find it interesting that the telecommunications manager stood up to Mensinger about not filling 9-1-1 dispatchers with volunteers and 2 days later she is under an investigation launched by Hatch and Mensinger...when she was exonerated yes exonerated she then had her position eliminated! We won't go there because I hope she files her law suit for being discriminated against and harassed for being an female Hispanic! Also she was awarded telecommunications manager of the year in April for the entire state of Cailfornia....! Costa Mesa is losing a 32 yr employee who is valuable to the public safety position. I doubt any Lt. Has her experience or expertise..let alone would want the job. Oh well....she already has 4 job offers...their gain...City loss! Too bad Mensinger and Hatch are such sexist the eliminated 2 civilian manager positions that were held by 2 females......law suit law suit ! I hope both these women will be recognized in a court of law how wrong they were let go and I hope they sue them civil court as well! Any Lawyers interested reading this blog? It's a solid case! So Mr. Grihalva is being punished for daring to speak out against Righeimer and Mensingers plan to change the ems system without even consulting him or the head of the fire department? That's scary power. Is there anyone left to do his job or does the city just not care about providing ems anymore? And if buying out undesirable motels reduces crime and therefore the need for police, shouldn't the motels be dealt with before cutting police? Fire, ready, aim again? 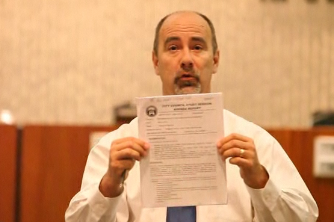 Mr. Grihalva was so desperate to save his job that he LIED about the EMS charges to seniors. That's "probably" why he was punished. Senior services are NOT free. No matter how poor you are, you get charged $300 by CARE. If you don't pay, your account is immediately turned over to a collection agency. CARE Ambulance is vicious, --- in case you have never done business with them! Sexist Mensinger......the idea is to give the responsibility to a Lt. that already exists in the department. Translation: the Lt. takes on more responsibility while the city sheds a position. Further translation: savings. I am not a fan of these guys but that is what the proposal is. Don't confuse it as you will not help your cause. "Not So", you are confusing the issue with Grihalva. EMS service from CMFD is free. Care merely provides transportation and that is what you are getting billed for. Under the privatized model, Care would provide paramedic service (not CMFD, and thus you would be billed for the EMS care AND the transport. Now, whether that is why Grihalva will be out of a job or not, is a horse of a different colour. Wyatt Earp, thank you for clarifying the rant by "Sexist". That's exactly how I read the proposal too. Now, I'm no fan of the council, but that does make sense. My guess is that the removal of the telecommunications manager has little to do with gender, and much to do with lack of competence. Whatever award she got from some body that does not have to work with or for her day to day has little relevance. This council is not Republican. This council is RADICAL. I've been a Republican all my life, and this horse manure has nothing to do with the party of Lincoln. sexist mensinger: It does make sense to eliminate an additional civilian position and transfer those duties to existing personnel. This is a good means of saving money! The Communications Manager who has worked for the city for less than 6 years had been under much investigation along with her favored staffers for major ethics issues/discrimination toward her employees, diminished quality of service to the public as well as police and fire departments during her short stint in the telecommunications/9-1-1 center These problems are UNPRECEDENTED and can no longer be tolerated. It is time for change and this is a positive plan for much needed and long over due improvement. Hopefully accountability will return and the hidden corruption will finally cease. You sound like the disgruntled emplyoee that you are, how does it feel not getting that promotion? and now putting out on these blogs? You can never take away that you just dont qualify. The manager we have asked for accountability... including cutting your overtime...over and over...and every time she tried ....you cried.......! You just cant accept that she wanted to bring in entry level dispatchers to do what you thought was your coveted right to maintain...all because you wanted the overtime! you are the eptiomy of what the public is upset about, the government employee that is entitled! I hope you can sleep at night....because you know that this is the best manager we have ever had in our center...just because she didnt let you get away with gouging the citizens of costa mesa...she always did what was right by cutting the OVERTIME! lockupthewolves...let's look at the math here. Currently a Lt. position and the telecommunications manager position exist. The city eliminates both, but brings back the Lt. position to handle, among other duties, police and fire communications. The end is the same, the city sheds a civilian position leading to cost savings. Further, the Lt. carries a gun, baton, etc. and can be used outside the telecommunications center where the civilian cannot. Makes sense. Brighter future.....YOU have NO FUTURE.....you need to pay attention and do your job. If you would stop writing grievances and sending anonymous letters to council and the press and telling lies only to have all your grievances denied...anonymous letters not published because you hate the telecommunications manager for making your work for your pay....you would realize word on the street from other agencies is come October the Sheriffs department is taking over communications, radio repair, etc. The consultants have outsourced You! Your grievances and anonymous letters cost you and your coworkers their jobs! I think the satisfaction is you will never work in this field again and be unemployed. You and your other disgruntled employees didn't stop to think come reference time who are they gonna call? yep the person who is sought after and well respected in her field. You are a joke. Wyatt, thank you for showing the on-going battle of sown vs civilians. Sworn always runs civilians over with the bus. Really because you carry a gun that gives you the knowledge to run a communications center? REALLY? Then I guess anyone who carries a gun and is sworn is able to do the Chiefs job too! Mark you better get busy with that resume oh wait your incompetent too. lockupthewolves; Don't under estimate the citizens and business owners of Costa Mesa! We know more than you think. number 1 on the list...I said no such thing regarding whether a sworn officer is more or better than a civilian to run telecommunications. I only pointed out the sworn officer is capable of more than simply running the tel comm center. But if you need me to go through it again, a sworn officer in addition running telecommunications, can makes arrests, take reports, assist with civil disputes, etc.,. Need I go further? I didn't think so. The key is civilians provide support services. Sworn officers are the operations. It is sad to watch co-workers tear each other up and call each other out in a public forum. Any credibility you thought you might have had, has evaporated. Don’t presume you know anything about someone’s identity. Telecom employees love to gossip, you share your dirty laundry with anyone who will listen, officers, non-sworn, co-workers and even employees at other agencies. I have never been employed by the city of Costa Mesa and I have heard more about your internal problems than I care to. Here is a hint, if you work part-time somewhere else, leave your dirty laundry at home, we really don’t want to hear it anyway. The turmoil within your agency is the worst kept secret in the county. Number 1, I resent you saying, "Sworn always runs civilians over with the bus. Really because you carry a gun that gives you the knowledge to run a communications center? REALLY?" Your statement is unfair and a mischaracterization of the environment at CMPD. While I have refrained in the past from commenting on many of the inflammatory and trivial posts obviously coming from people working for the police department, I absolutely cannot refrain here. With that said, I can honestly say that I have never "run over" civilians, which is a far cry from the "always" you claim. In fact, I have always appreciated the jobs non-sworn (civilians) do and have been vocal about the importance of non-sworn positions in both public and private forums, discussions, and meetings. Even more important than what I have said and done is the fact that I am not alone in the "not running non-sworn over with a bus club". There are many of us and you are selling these officers short. I am not saying life is perfect at CMPD (only someone with their head in the sand would believe so) of course there are personality conflicts, arguments, misunderstandings, and any host of problems that exist in every other workplace everywhere, but the broad characterizations you make here (like nearly all broad characterizations/generalizations) are inaccurate, misleading, and downright unfair to the vast majority CMPD officers. I don't believe I could run a communications center much less answer an incoming call, toggle between the five computer screens you must look at even for simple dispatches, and successfully send officers where they are needed seconds after you receive a call. I also would not currently be able to do the detailed jobs of the department's records technicians, CSI, animal control, and many other non-sworn (civilian) jobs. I also don't believe the weapon I carry gives me special power or knowledge, in fact I think that is fairly obvious since my non-existent super powers failed to prevent me from breaking my back and crippling my life. I get it, your jobs are hard and stressful often and everything going on can get to you. Please know that I appreciated you before, appreciate you now, and will appreciate you in the future if and when we ever work together again. Please resist the temptation to get into a bickering match on a blog as it is unbecoming and ugly. Please focus on why we all decided to work in whatever position we did at CMPD- to better the community, to make it safer in every and any way, to help people when they need it the most, and to help prevent/solve/stop crime. There are so many people both sworn and non-sworn that are needed to perform this difficult task especially now when every shift is understaffed, overworked, and people are simply exhausted. There is no reason to add to the stress that everyone is carrying on their shoulders these days by creating a soap opera for anyone to view. Sworn and non-sworn are not at war with each other. No matter the politics it doesn't change the fact that the community still needs us and we still need each other; we have a job to do. Please think before you post. Brown Act To Become Constitutional?